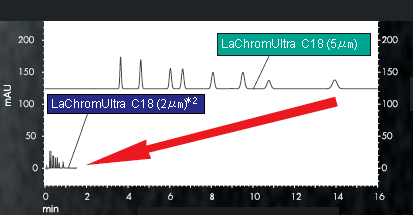 LaChromUltra delivers ultra-fast analysis, higher resolution, increased sensitivity and the flexibility to run both higher pressure and conventional HPLC analyses on a single system. LaChromUltra delivers ultra-fast, high-resolution analyses through a balanced optimization of a 2μm particle column and a maximum 60MPa system pressure. Ultra-fast analysis times: Reduced to about 1/10, as compared with our conventional HPLC. Accurate and complete data: detector response times (0.01sec) and sampling periods (10msec) designed for high speed analysis. Easy to use: finger-tight column switching system allows you to easily change between ultra and conventional LC columns. Flexible: Choose Hitachi's 3 or 5μm particle columns for easy method transfer between ultra and conventional LC applications on one system. Dual-plunger reciprocating pump (seriesconnection, pulsation suppression) Max. The organizer is capable of supplying power to two pumps, one auto sampler and one detector. It is also usable as a reservoir to accommodate solvent bottles. *Windows�XP is registered trademarks, and other company names and merchandise names are registered trademarks or brand names of respective companies.